Please welcome Catherine to the blog today. She is here with the third installment of the Size 5 Project. This series has to do with giving the original four Oliver + S patterns a fitting goodbye before the children we sew for outgrow them. We started it with the Puppet Show Shorts, then continued with the Tea Party Dress, and now we are tackling the Bubble Dress. Catherine has got a Bubble Dress round-up for us right now. Here she is. Thanks for having me on the Oliver + S blog, and for the opportunity to be part of the Size Five Project. This was a childhood milestone I hadn’t seen coming! With both my daughter and my niece turning five this year, I’m feeling glad that the Size Five Project has nudged me into action to use the old favourites whilst they still fit. And my favourite of those favourites has to be the Bubble dress. There’s something about the bubble shape which must resonate with everyone who grew up in eighties, back when puffball skirts had their moment in the limelight. 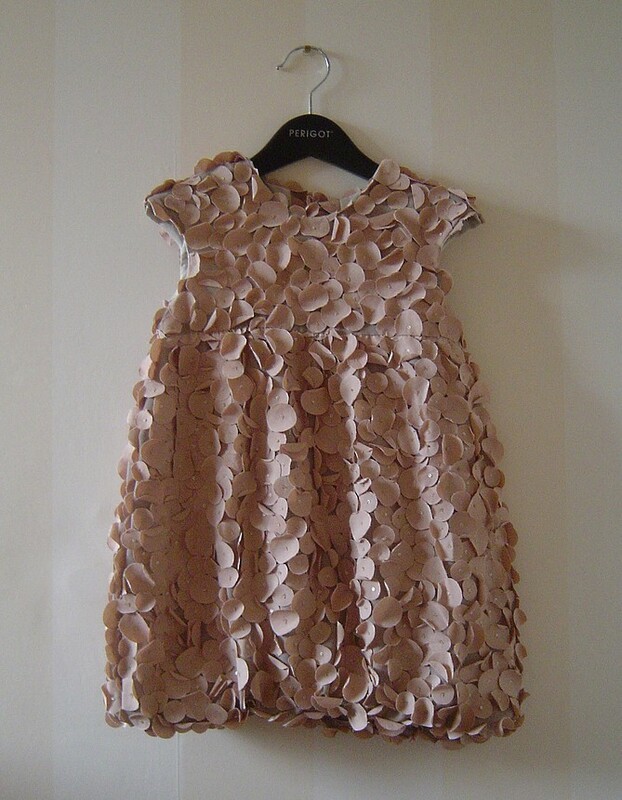 The Bubble dress was my first Oliver + S pattern–when my daughter was a babe-in-arms–and I remember being amazed at the number of compliments it attracted–sometimes from total strangers in lifts or supermarket queues! Now that I’m making size 5 I’m still finding new things to love about this pattern and new inspiration from the many variations on the Flickr group, so I thought we’d start with a look at a few of these. This version by Marie-Michelle in an gorgeous chiffon voile fabric was one of the first to set my heart aflutter, and when I searched it out again it still looked just as good as it had in memory. It manages to show just how sophisticated the Bubble can be, while still being totally appropriate for a pre-schooler…. Here’s another glamorous Bubble from Nicole, again using a fabulous fabric for a beautifully formal look. It’s not all just a special occasion dress, though. The clean lines of the Bubble lend themselves to fun prints, and of course the elastic in the hem allows for lots of movement. 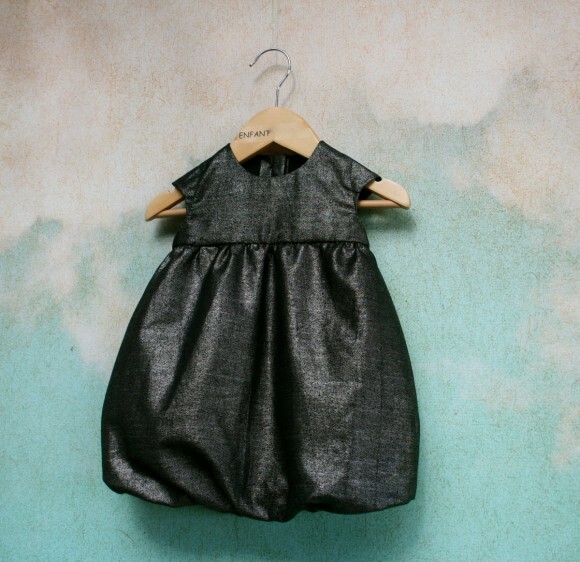 I love this photo from george&izzy, where the dress looks like the perfect choice for when you’re off on an adventure. Meanwhile this version from sarahlamont45 is taking a walk on the wild side with a fantastic jungle print. Part of the original appeal of the Bubble dress, for me, was the option to include scallops along the edge of the skirt. 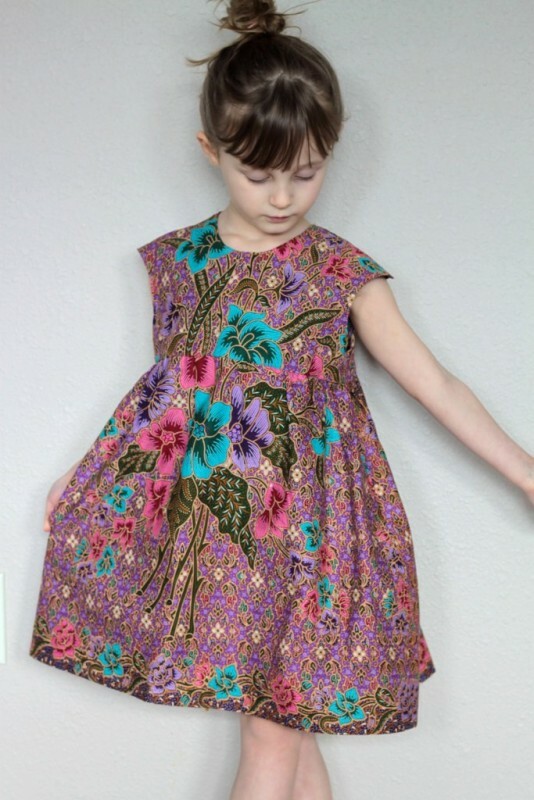 Here’s a lovely version from NOTyourrunofthemill where the scallops work beautifully with the bold floral. Despite the name, the Bubble dress isn’t only about the bubble: that bodice has a gorgeous shape of its own, and there are plenty of ‘de-bubblefied’ versions which use the bodice matched with a full skirt. I love this one from Carolyn (who came up with the description). 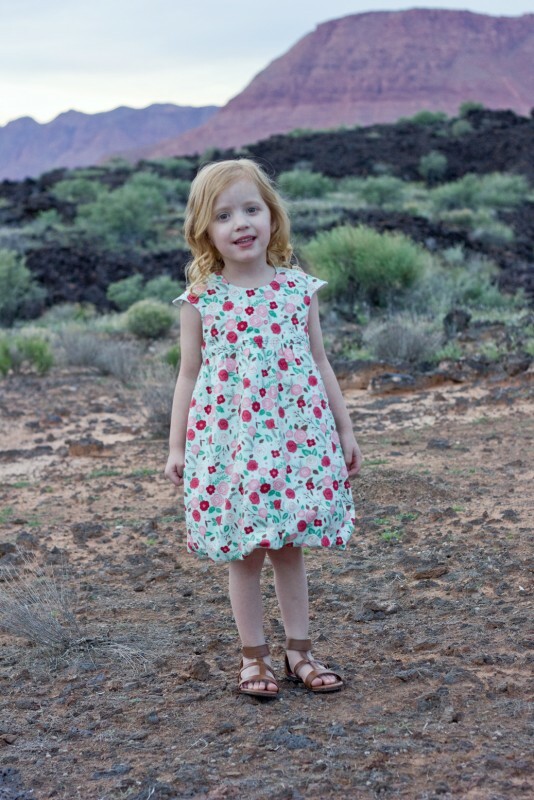 And charm.mama managed to combine debubblefication with a clever border print–and then multiplied it by three for these sweet flower-girl dresses. Last but not least, there’s something about the bubble dress which inspires creative costume-making. 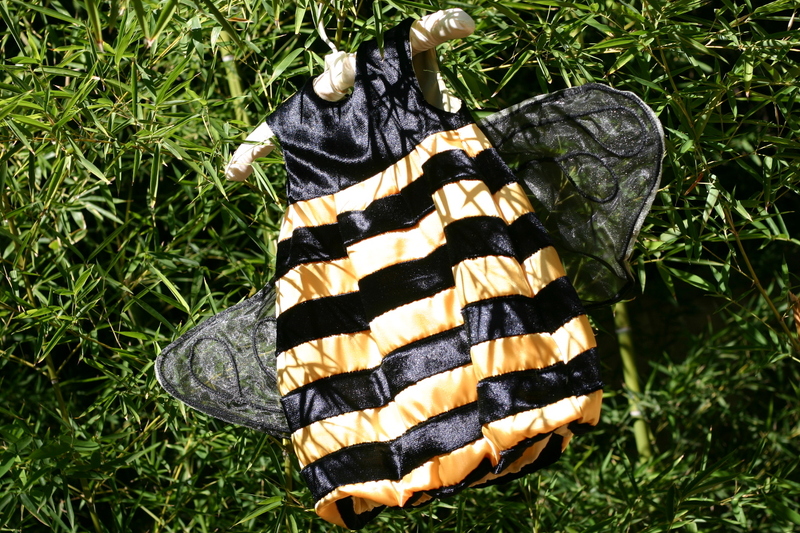 JenLoving’s bumblebee, complete with black velvet stripes and gauze wings, seems to be flying away all on its own. And finally, a spectacular volcano from Juliamom2009. Do have look at her blog post all about the process of creating it. So now we’ve had a look, shall we sew? Thanks so much Catherine for all of the wonderful inspiration. 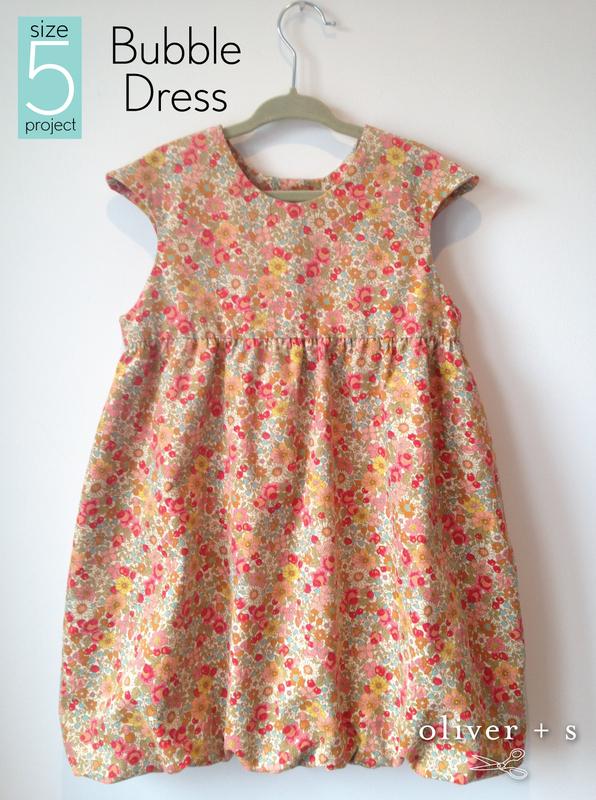 Please join Catherine for the Bubble Dress sew-along tomorrow and the day after. Thanks, Catherine! This is a fun trip back in time for me. I love all these versions, and I can envision S wearing her Bubble Dress and sandals when I first designed the pattern. A favorite, for sure! 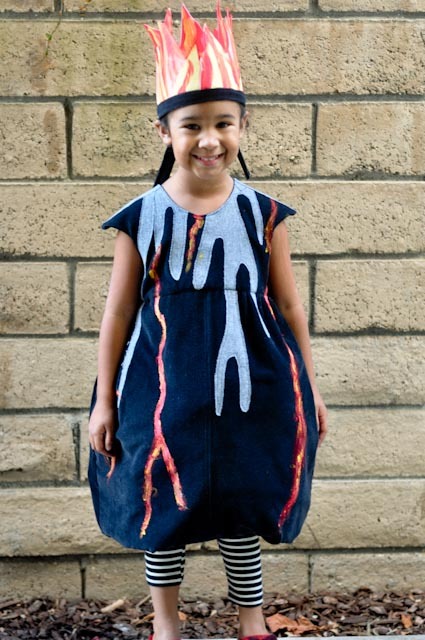 Oh my goodness that volcano costume is so awesome! And the purple floral “de-bubble-fied” dress by Carolyn is stunning. Thank you for featuring Trixie’s Bubble dress Catherine. I was surprised how much wear she got from it. She wore it many times over Tea Party Liberty knickers over grey tights. Such wonderful examples. I’m *still* looking for a fabric like that one Marie-Michelle used. Although there’s a world of difference between buying nice fabric and being able to sew well!